Jeremy Corbyn will address party members on the last day of the four-day event in Liverpool. His speech will focus on big issues including Brexit, green energy and the proposed renationalisation of key sectors including the railways and water industry. He is also expected to launch an attack on “greed-is-good-capitalism” and the “political and corporate establishment”. Labour posted a silhouetted picture of the 69-year-old Labour leader “making the finishing touches to his speech” yesterday on Instagram. What time is Jeremy Corbyn speech today? What will he say? Mr Corbyn will make his speech at 12.15pm today, with live streaming on Labour’s Facebook page and YouTube channel starting at 12.15pm. You can also watch on BBC Parliament, BBC iPlayer, Virgin Media 605 or Sky channel 504. 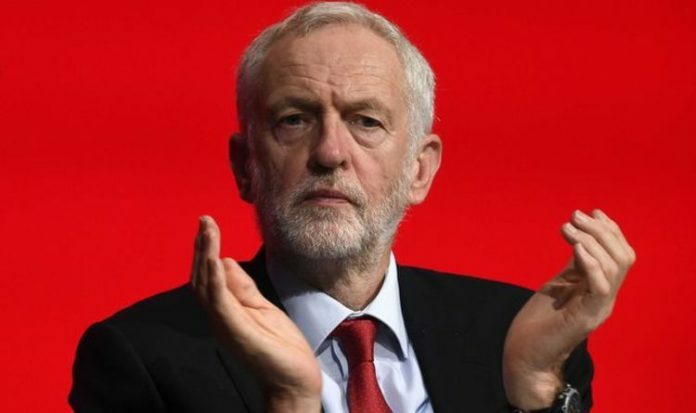 The Labour leader has vowed to cut the UK’s carbon emissions by 2030 through 400,000 new jobs and investments in technology. He will say: “There is no bigger threat facing humanity than climate change. We must lead by example. “It needs a government committed to investing in renewables, in jobs and in training. “I can announce today that Labour will kick start a green jobs revolution. But Mr Corbyn is also vowing to introduce a “radical plan” to “rebuild and transform Britain” which he says has failed millions of people since the financial crash of 2008. He is expected to say: “Ten years ago this month, the whole edifice of greed-is-good, deregulated financial capitalism, lauded for a generation as the only way to run a modern economy, came crashing to earth, with devastating consequences. ”But instead of making essential changes to a broken economic system, the political and corporate establishment strained every sinew to bail out and prop up the system that led to the crash in the first place. “People in this country know – they showed that in June last year – that the old way of running things isn’t working any more. Mr Corbyn’s speech comes after Shadow Chancellor of the Exchequer John McDonnell vowed to introduce several policies to attack wealth inequalities including new taxes on second homes. The Confederation of British Industry (CBI) warned workers could see a “drop in living standards” as a result. Carolyn Fairbairn, CBI Director-General, said: “Labour must meet business halfway or they will crack the foundations of this country’s prosperity. Jeremy Corbyn is expected to say some words about Brexit but no indication has been given of what he will say.